As we know from an earlier blog post, Walt Disney was a huge fan of miniatures. Disney dreamed of creating little vignettes of America, placing them on a train, and touring them around the U.S. 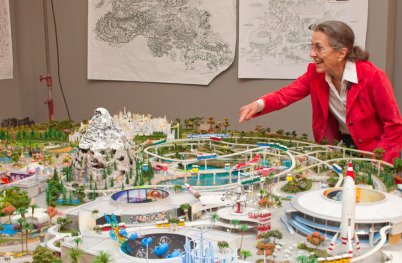 Although “Disneylandia” eventually grew to be a much bigger project, Disneyland, his “lands” were miniaturized and put on public view at The Walt Disney Family Museum. “The Disneyland of Walt’s Imagination” represents the park with attractions that existed or were in development during Disney’s lifetime. 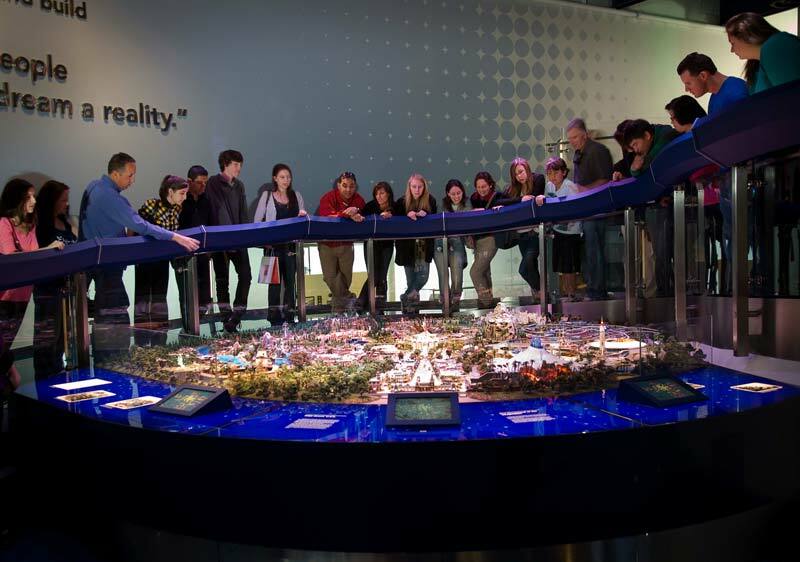 Disney’s daughter, Diane Disney Miller, and her family worked with Kerner Optical for nine months before premiering the model at the museum in September of 2009. As with any other miniature, no detail was overlooked. The Rivers of America were crafted out of blue-painted shower door Plexiglas on a green base to create the illusion of depth. And all the hand sculpture flags fly in an eastern direction just as they would in Disneyland due to the western ocean breeze. Anyone familiar with the park may wonder if the model includes any hidden Mickeys. It doesn’t, but don’t be disappointed! Two hidden Walts can be found walking with his daughter behind Sleeping Beauty’s castle and riding in a red Autopia car. Photo: Courtesy of The Walt Disney Family Museum.